played in local community orchestras. My brother being the oldest, boldest and wildest naturally picked the drums. play guitar. For the life of me I can’t remember why or even if I had a reason why, but that’s what I went with. said, “So are you ready for those guitar lessons yet?” Figuring that I couldn’t wimp out twice, I got signed up. 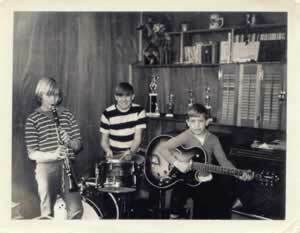 actually played anything together; but we sure looked like a group when we posed for the picture. got old fast and after a while I grew to resent it. Finally I quit and stuffed the guitar in the back of the closet. chords. (Thanks Rob!) Then, totally encouraged I purchased a barre chord book and taught myself rock and roll. 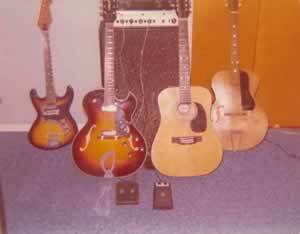 collection and not my guitar playing. We’ll skip ahead to the acquisition of my second, third and fourth guitars. Norma solid body guitar from Two-Guys and when he gave up trying to learn how to play he sold it to me for $25. 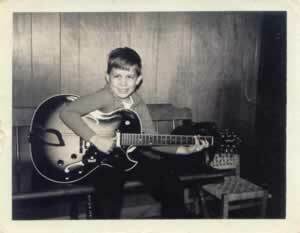 leaving that guitar with a buddy of mine when we lived in California. (You’re welcome Sean!). did play very well but it looked nice and to this day it hangs on the wall in my bedroom. flames dancing off it from the burning finish. We sang Jimi Hendrix songs as a tribute. (Thanks Neil!). click HERE to continue on.